The house patio pergola is a safe place to hang my various bird feeders in winter. It's high, with nowhere for cats to hide, sneak up, and pounce. And I can watch the feeding antics from the warmth of the house. 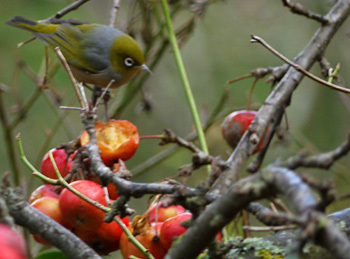 Native birds in my garden, like bellbirds and fantails, are nectar and insect feeders. 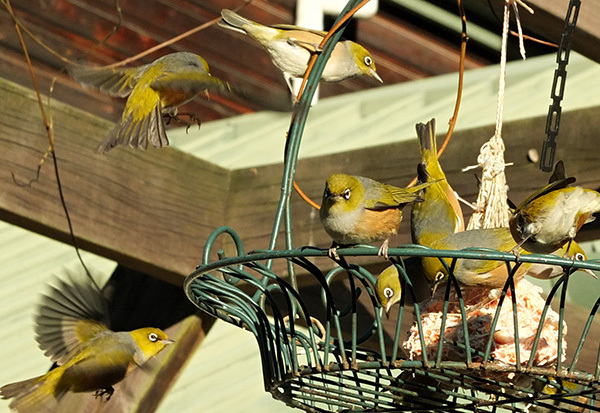 They tend to look after themselves - it's common in the garden to be followed by a flock of acrobatic fantails. They like their insects on the wing, and busy gardeners are the perfect people to stir things up. Then I grow a lot of native plants like Phormiums especially to feed the bellbirds. My garden is too far south in New Zealand for any tuis to visit. In winter I notice flocks of wax-eyes, wee birds introduced from Australia, as well as the heavier blackbirds and the occasional spotty thrush. Crab-apples provide a good enough feast, but I worry that the tiny wax-eyes won't find enough food and energy to keep going through the cold months. So I hang up big balls of seed-covered lard, fresh pineapple and apple pieces, and bowls of grainy bread coated with olive oil spread. These are covered by fluttering birds from before dawn until after dusk. My birds love their feeders. There is some debate as to what should be fed to wax-eyes. Some folk say they need only honeyed water and fat isn't good for them. But my patio echoes with the excited squeaking of hundreds of birds, who pop in for a peck and then zoom off to sit in the Wisteria. I love watching them. Well done you birds - just be careful of the seven cats who live and share this house and garden.